Harley Davidson NYC tenía un problema habitual en los concesionarios de vehículos de lujo: exceso de stock a pocas semanas del cambio de modelo. En un sólo fin de semana utilizando Albert, logró rápidamente quitarse de encima el sobrestock, y ahora su CEO atribuye 40% de las ventas en la zona a la plataforma Albert.ai. Una Compañía CPG líder en un gran mercado BRIC, decidió probar Albert en un test en paralelo con su renombrada agencia de medios tradicional. Albert logró en 3 meses realizar mas de 1000 veces mas cambios/modificaciones a la campaña que la agencia y obtuvo 50% mayor eficiencia de medios. Bienvenidos al advertising.ai, o la publicidad Figital. Bienvenido Albert.ai a Neural. Preparing for a Figital technology presentation last month at the Latin America International Council of Shopping Centers Conference in Santiago, a thought came to mind. Urban Outfitters, for more than a decade a fast growing retail chain, cornered by declining brick n mortar sales, has resorted to repurposing its stores to incorporate a Pizza chain from Chicago. Seeking Experience? Seeking to maintain store footage at a reasonable cost? A differentiating or a defensive strategy? Only time will know. As traditional retail chains face ever increasing competition from E-commerce (25%+ penetration in durables + clothing in US by 2016 according to BI), malls need to quickly reinvent themselves. Although mall visits are not declining yet, sales per square foot continue to erode at a steady pace. Fashion and durables retailers continue to close stores at an average of 5% during the past 5 years in the U.S. Some mall operators have chosen the path to focus more in experience & entertainment, finding the hard way it is not an easy job. It requires to dramatically change the organizational culture from retailer to entertainment driven, to become more sensible to taste nuisances, and even so, it does not guarantee the return or productivity of replacing brick n mortar retailers. As the most successful players move towards iconic, experience driven and traffic magnet locations, shedding less popular, traditional retail ones, what is left for the rest? Is there another way beyond repurposing or closing? We think there is: Figital mall is the mall of the future. It starts by acknowledging that shopping is a key human behavior, and hardly will be done away with. But also, by taking into account that busy interconnected urban life requires a new value proposition from mall operators. A value proposition based on tenants whose stores will serve multiple purposes in the new complex Figital consumer decision journey: traditional retail sellout, Showrooming, and last mile distribution center. And therefore a new business model will need to emerge, one that we believe gives malls an enviable scale to participate more decisively in the retail experience and transaction. 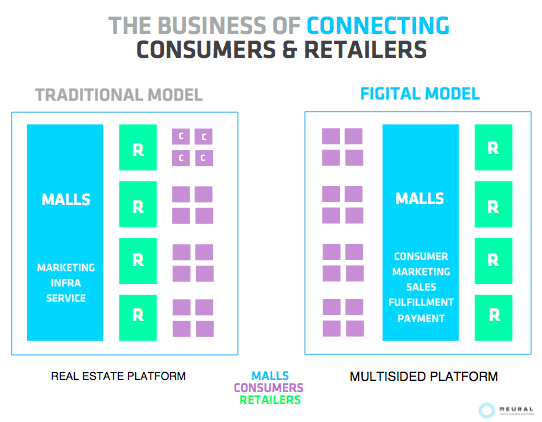 A model where -enabled by technology- the Figital Mall can really be at the heart of the connection between shoppers and retailers, and not just be a realtor, demand creator or entertainment administrator. Figital Malls connect seamlessly to shoppers, understand their intent, most relevant missions, effectively tailor their product and entertainment mix to sweet spot core shoppers, while reducing most of the friction from the traditional brick & mortar experience. Figital Mall Operators both embrace and understand big data analytics, optimizing operational performance, better interpreting trips and missions, to capture value for both mall and tenants. Through retail technology, this new shopper centric model enables the Figital Mall operator to potentially participate and capture value not only at demand creation, but also at payments, fulfillment, and delivery. 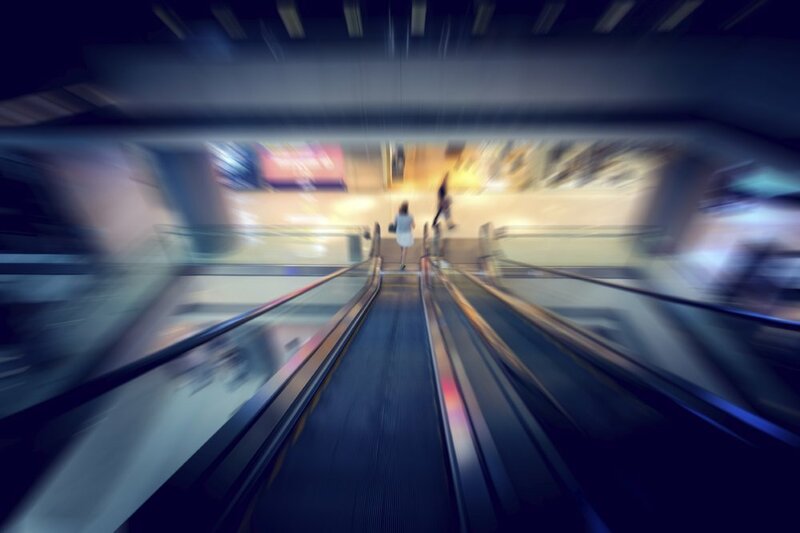 It allows the mall to claim the center role in local marketing, leveraging both proximity and community as key assets within the relationship between traditional retailers and shoppers. As the future promises to shake up the global retail industry on its feet, Figital Mall operators will be fitter and more flexible to capture disproportionate value in the retail industry. As same store sales continue decreasing at an accelerated rate, physical retail is becoming ever so under attack by e-commerce pure players, big box retailers with early investment in e-commerce, as well as artesian startups that harness the power of the digital channel to compete head to head with established brick and mortar mainly Outfits. As more consumers continue to spend yet more time on smartphones, retailers need to think not just about eCommerce or mCommerce but also how customers use their phones in stores. While shopping or browsing in-store, consumers often have their phones in hand, and retailers have many opportunities readily available to provide product information and service to close the sale. With the right tools and organisational mindset, there is a chance for incumbents to withstand the digital avalanche, and emerge as fit leaders of a new breed of retail: Figital Retail.